Interested in quitting: current smokers who reported that they wanted to stop smoking completely. Made past-year quit attempt: current smokers who reported that they stopped smoking for > 1 day in the past 12 months because they were trying to quit smoking and former smokers who quit in the past year. 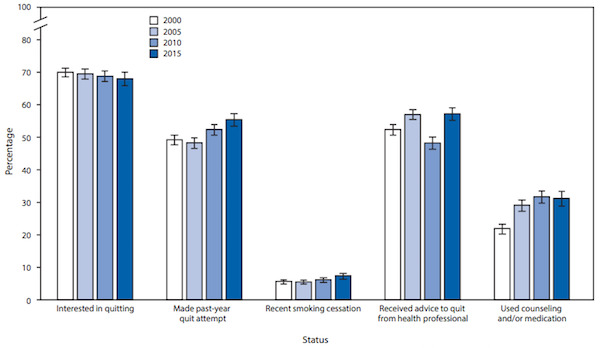 Recent smoking cessation: former smokers who quit smoking for ≥ 6 months in the past year, among current smokers who smoked for ≥ 2 years and former smokers who quit in the past year. Received advice to quit from health professional: received advice from a medical doctor, dentist, or other health professional to quit smoking or to quit using other kinds of tobacco, among current and former cigarette smokers who quit in the past 12 months. The analysis was limited to current and former cigarette smokers who had seen a doctor or other health professional in the past year. Used counseling and/or medication: for 2010 and 2015, used one-on-one counseling, a stop smoking clinic, class, or support group, and/or a telephone help line or quitline; and/or the nicotine patch, nicotine gum or lozenge, nicotine-containing nasal spray or inhaler, varenicline (U.S. trade name Chantix) and/or bupropion (including trade names Zyban and Wellbutrin) in the past year among current smokers who tried to quit in the past year or used when stopped smoking among former smokers who quit in the past 2 years. For 2005, the list included a nicotine tablet and excluded varenicline, as it was not approved by the Food and Drug Administration until 2006. For 2000, the list included a stop smoking program and excluded a stop smoking class or support group, nicotine lozenge (not approved by the Food and Drug Administration until 2002), and varenicline. Data Source: National Health Interview Survey, 2000–2015. This entry was posted in Medicine and Society Data Watch on January 11, 2017 by Genevra Pittman.